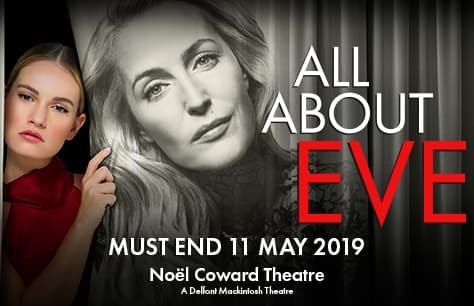 All About Eve tickets now on sale at the London West End Noel Coward Theatre, starring Gillian Anderson and Lily James. Produced by Sonia Friedman and directed by Tony and Olivier Award winner Ivo van Hove, the adaptation is expected to open at the Noel Coward Theatre in London from February 2019. Also joining the cast are Monica Dolan and Sheila Reid. All About Eve is based on the short story "The Wisdom of Eve," by Mary Orr. The film, made in 1950, was written and directed by Joseph L. Mankiewicz and starred Bette Davis, who portrayed the character of Margo Channing, a prominent yet ageing Broadway star. Anne Baxter played Eve Harrington, a willingly helpful young fan who insinuates herself into Channing's life, threatening Channing's career and personal relationships. All About Eve was nominated for 14 Academy Awards and won 6, including Best Picture. Ivo Van Hove won the 2016 Tony Award for Best Direction of a Play for Arthur Miller's A View From The Bridge. As General Director of Holland's leading theatre company Toneelgroep Amsterdam, Ivo Van Hove has staged many internationally acclaimed productions, including, in New York: Alice in Bed, More Stately Mansions (Obie Award), A Streetcar Named Desire, Hedda Gabler(Obie), The Misanthrope, The Little Foxes, and Scenes From a Marriage, all at the New York Theatre Workshop; Roman Tragedies, Cries and Whispers, Opening Night, Angels in America, and Antigone at BAM; and Teorema at the Lincoln Center Festival. Book your All About Eve tickets now for a limited 14 weeks run, coming to the Noel Coward Theatre London.